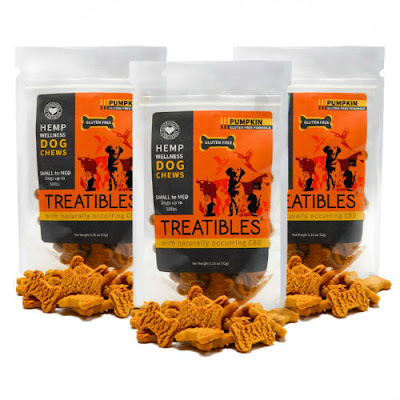 So what are CBD dog treats from Treatibles? 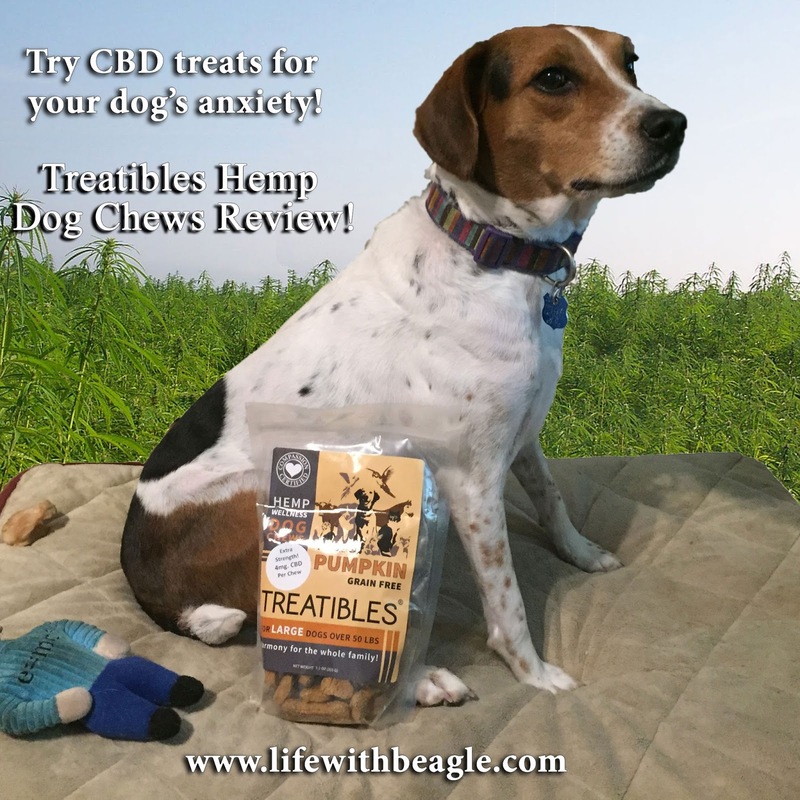 Treatibles Pet Chews are dog cookies that use CBD oil from Hemp (not MARIJUANA!). CBD is a cannabinoid (called cannibidiol), a chemical compound found in both Hemp and Marijuana. It doesn't get you stoned though -- in marijuana, the chemical that gets you stoned is THC, and, again, Treatibles are made with oil from hemp. The research is still being gathered, but CBD oil has been known to help with certain conditions, including anxiety and seizures. The CBD reacts with the endocannibinoid system in the brain, which is a group of receptors that help deal with things like appetite, memory and mood. It's believed it's what produces the concept known as runner's high. 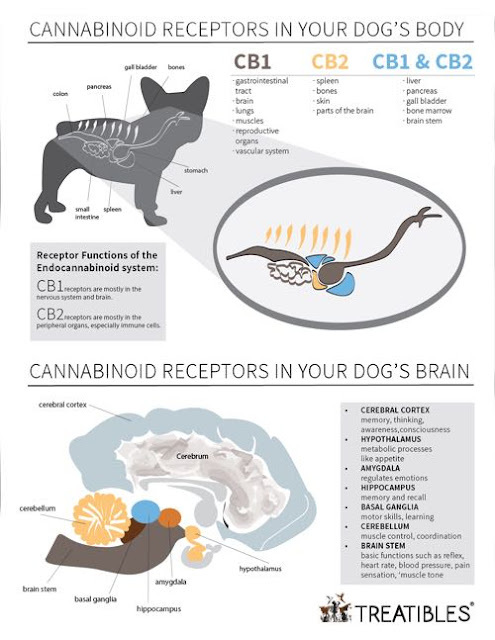 When the drugs like CBD interact and bind with the receptors, leading to beneficial effects. Treatibles sells a number of CBD products. We've been using the pumpkin dog treats, gluten-free biscuits made with oat flour, coconut oil, pumpkin, peanut butter and other ingredients. Jasmine watches for the cue to treat! The hemp itself is grown in Colorado. The treats are made in small batches in California and it's all lab tested three times with a third party before it's sold. Treatibles sent me a bag of large treats, which have 24 treats and cost $32 a bag. One treat is enough for a 40 pound dog -- unless you have a dog like my Jasmine, who is always anxious. The effects can last up to eight hours, depending on the dog. Treatibles says dogs can never overdose on CBD, and it doesn't build up in the system. How do your dogs act on Treatibles? Jasmine is will, at least once a week, go under my bed. I don't know how she gets under there, but she but once she's there she won't get out. Jasmine hides under my bed... which I really should try to vacuum. She also will come up to me and start shaking randomly during the day. She also seems to have trouble with loud noises -- if she's at a place that's really cavernous, with lots of echoing and sounds reverberating, she will put her tail between her legs, sometimes shake. And it's clear she wants to leave. The other thing she may show is aggression. 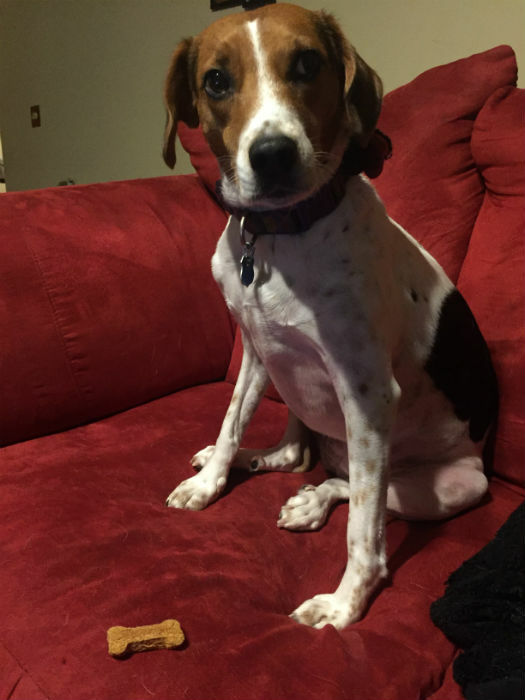 She has bitten dogs, and she will sometimes snap at people if she wants them to get away. 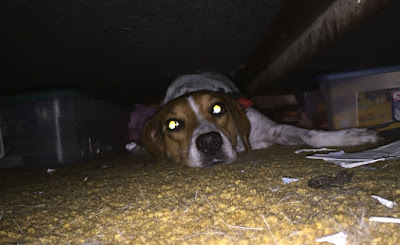 Since I started giving her Treatibles, I have not noticed any shaking and she has not been hiding under the bed. It's been about a week on a daily basis, and off and on over the past month when Treatibles gave me some samples at BlogPaws 2017. I've not attempted to test her sound and strange location triggers on Treatibles yet. But just the fact that she's not shaking or hiding for reasons I don't know is a good sign. How does she act? Aside from not shaking or folding those long legs under my bed, she's just mellower. She lays down, she seems peaceful. I won't say it's a complete transformation but she doesn't have that pensive look she'll get, with her ears pinned back and her eyes wide and full of fear. To me, that's a start. You can buy Treatibles CBD dog treats and other Treatibles products right on the Treatibles website. The site also has a store locator, so you can find Treatibles near you. What else can you do to ease your dog's stress? Summer is a stressful time for pets -- in Florida, we have near daily thunderstorms, with some quite severe. People go out on day trips, leaving the pets at home. They may also have cookouts and parties -- lots of different people inside the house, lots of noise. And the Fourth of July has fireworks, which can start days before the holidays and last for days after in some communities. 1. Keep outdoor activities to earlier in the day, and at a minimum. Dogs can get spooked by loud bangs and run off. Or they can show some of those anxiety signs I mentioned above. Plan for indoor activities like puzzles when possible. And around the Fourth of July especially, do your dog walks early, then get them in before people start blowing stuff up. 2. Try to keep some audio on for your dogs that is soothing. You can get specially designed music for dogs, or you can try classical music, or anything else that might be soothing for them. Jodi Chick at Kol's Notes uses Harry Potter audio books. Whatever works! 3. Create a safe spot for your dogs that they can easily get to (not under your bed!). Have favorite blankets or pillows and toys at the ready. Give them treats like Treatibles or something that's safe to chew on. Have a distraction in mind whenever possible. 4. And finally -- be sure to keep your own anxiety in check. Dogs can sense your fears. This week is Pet Anxiety Awareness Week. You can learn more tips by going to the Pet Anxiety Awareness Week website. Jasmine and me, when she's happy. 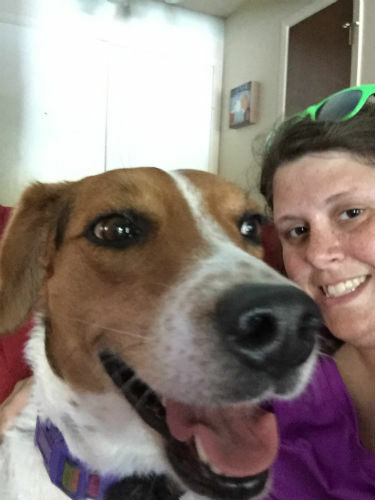 I have three rescued Treeing Walker Coonhounds, two of who were likely used for hunting and who both are extremely fearful of thunder, fireworks, etc. I've tried several things to help keep them calm and am still looking for the right product(s). I currently use a Thundershirt for each, with a few sprays of calming spray. I also use some calming tablets made by GNC. All three things together really help, but it's still not perfect. I'd love to see how these work for my dogs. My beagle had bad separation anxiety when I first adopted her. She has improved significantly with a consistent routine and some desensitization training, but she still has separation anxiety when we travel and visit new places. I would love to try Treatibles so that I could have some on hand when we visit family and friends. I am also moving soon, and I do worry that the new location may bring back some of her old anxiety, so Treatibles would be great to try as we settle into a routine in the new house. Because I have 2 Golden Retrievers and my kids are always having them do tricks for treats and these look like they would love them. My mom has an older dog who has terrible anxiety during thunderstorms (which we have a lot in the South) and she is having a hard time keeping him calm even with the thundershirt. I want to try these because my dog gets so scared of storms and fireworks and has a leg problem. That's great to hear that Jasmine is so much mellower on Treatibles! My older dog Helo could really benefit from these for his anxiety. Entering! she definitely gets stressed out with thunder storms! I would love to try Treatibles to help with my dogs severe anxiety. He is on prozac now but I would love to find something that works to try to get him off that medicine. I have a very skittish rescued Beagle and Yorkie and I would love to try these! My adorable weiner dog loves treats but he is also nervous at times so these would be perfect for him. My dog, Domino, is very relaxed with my husband and I, but when others are around, she gets more agitated. If these treats can help her be calmer when others are around, it would be a great thing! my two furbabies always seem to get upset when we leave the house and they will bark for a long while. Sounds interesting and would love to see how my dog would react. Started using these when my dog was diagnosed with cancer and also for my other 2 dogs which are 16 and 15 years old and they have helped all my furbabies so much :) highly recommend this awesome product. My staffie has become very fearful during storms, he hides and also digs into the carpet, sometimes untils his nails bleed. He wears his thundershirt and I will give him a small dose of tranq but really hate doing so. I just purshased hemp oil and capsules and am curious how long the oil will work or if I can use the oil for quick relief in conjunction with the capsule for longer results?